AMBRIDGE REGIONAL DISTRIBUTION & MANUFACTURING CENTER LEADS PARTNERSHIP TO CREATE RESOURCE GUIDE FOR HARMONY AND AMBRIDGE COMMUNITIES. 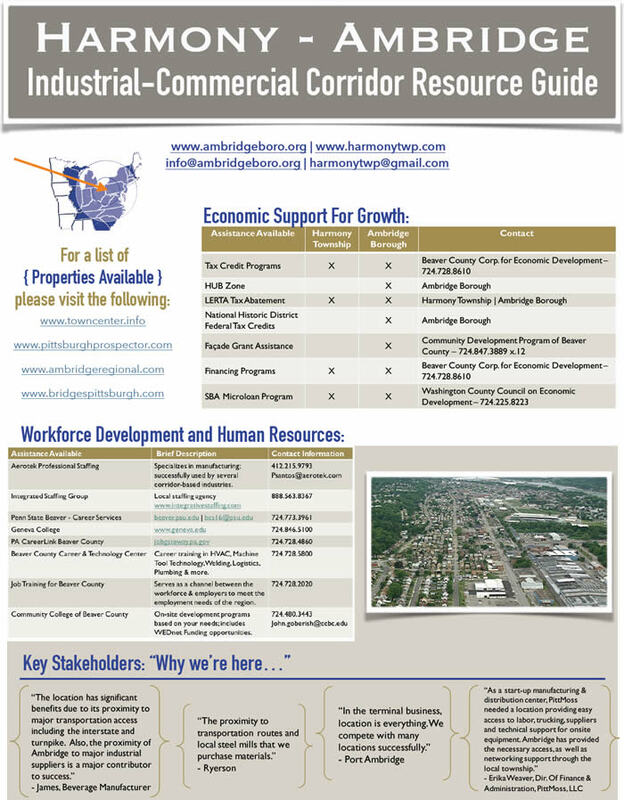 FOR IMMEDIATE RELEASE: Ambridge, PA, March 28, 2016– Ambridge Regional Distribution & Manufacturing Center (ARC) along with community partners consisting of Beaver County Corporation for Economic Development, Borough of Ambridge, Creekside Springs and Harmony Township, created the enclosed Harmony – Ambridge Industrial- Commercial Corridor Resource Guide (see image below). The Resource Guide is established as a reference for incentives and resources that our communities can offer to make corporate growth a reality to existing businesses as well as those in the site selection process. We can readily accommodate a broad spectrum of new industries and commercial development. In addition to the launch of the Resources Guide, key community partners have also been listening to community industry members and addressing their needs. For more information, please contact Erica Loftus at erica@ambridgeregional.com.